All Everleigh Carsen wanted to do was complete her final semester at Hensley University and begin the life she carefully planned. When a wave of violent crime seizes campus, Everleigh is persuaded to attend a school sponsored self-defense seminar by her best friend, where she meets volunteer instructor, Hunter Charles. After Everleigh’s biting sarcasm induces Hunter to eject her from class, a tempestuous relationship is born. Everleigh is determined to forget the striking man, but fate—that fickle shrew—continuously intervenes. Unable to escape him, she declares Hunter an enemy combatant. The only complication…Hunter is resolutely pursuing vindication…by any means necessary. Verbal warfare ensues, and despite Everleigh’s ingenious efforts, in Hunter, she has finally found her equal. Only For You is a compelling tale of friendship, desire, and redemption—brimming with intelligent characters, witty dialogue, unexpected twists, profound sorrow, unfettered hope, and love’s unassailable perseverance. 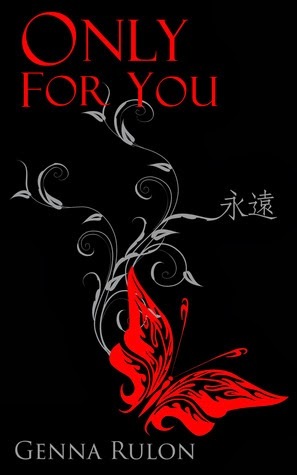 • Only For You is the first book in the For You series by Genna Rulon. Each book in the series can be read as a stand alone novel. Only For You embodied everything I love about contemporary new adult fiction: a smart heroine, healthy relationships between friends, a sizzling romance, and a mystery to boot. I loved this book! I loved everything about it and would not change a thing. I ended up reading Only For You in a day, staying up late to finish it, because I simply had to know how the mystery would resolve. Well, that's only a partial truth. I stayed up because I had to know how the love story (oh, the love story *sigh*) would end! I liked Everleigh right from the start. She's smart, witty, proactive, and has a great sense of humor. Everleigh comes from difficult circumstances, but she doesn't let her heartbreaking past keep her from pursuing her dreams. The one word that comes to mind when I think of Everleigh is resourceful. And I adore resourcefulness in a character: being able to better yourself despite your circumstances, and the ability to take care of yourself. Everleigh doesn't have a man in her life, and that's not to say she doesn't want one, but she refuses to settle. While she waits for the perfect guy to come along, she has fun with her friends. As much as I liked Everleigh, I liked Hunter and her best friend Sam just as much. They were very well-developed characters and so likable. Sam provided a lot of comic relief and made me smile so many times throughout the story. Hunter was just swoon-worthy. The circumstances surrounding Hunter and Everleigh's relationship could have led to some game-playing (which I despise) but instead, Rulon had Hunter pledge to always be honest with Everleigh and he kept his vow, no matter how difficult it was for him. The banter between Ev and Hunter was so fun. I loved how they simply had a good time together. They laughed a lot and just enjoyed each others company. Their interactions were full of clever exchanges, and I enjoyed how each tried to outsmart the other. I liked how their relationship was built on a solid friendship and slowly developed into something more. Besides the love story, which would have been enough to make me love this book, there was a mystery element to the story too. That element of intrigue took this book from great to awesome. I was on pins and needles waiting to see how the mystery would be resolved. I'm not saying that the addition of violent crimes on campus made me love this book, but the fact that Rulon added another layer to the plot gave the book more depth. And that depth is what's missing in many contemporary fiction novels. I like it when a contemporary fiction novel is more than a love story. Only For You is a good length: long enough to have a very detailed plot, full cast of characters, and great character development. I think the length was perfect, although I did find myself wishing it were longer when the story was over, simply because I did not want the book to end. I was enjoying it that much! I love it when authors start each chapter with quotes. Rulon does that in Only For You and the quotes were often about love, or friendships, and they added so much to the story. Some of the quotes were my personal favorites, and to see them used to set the tone for each chapter was really exciting. It's things like this that make a great book even more special. Only For You was everything I could have asked for in a contemporary romance and more. I am so happy that this book is the first in a series---and that each novel in the series stands alone. Rulon notes in the summary that there will be no cliffhangers----yay!---and that the books can be read alone or together. All I can say is, bring on book two! Wow! A mystery and a romance? I'm in!